I just received a newsletter from a former colleague with the following subject line; “Flat abs for Xmas”. This type of marketing is typical fitness industry stuff. Over-hyped, unrealistic promises that prey on your emotional triggers. I’m sick of it. Let’s get real! First of all it is probably impossible for you to have flat abs by Christmas. This Newsletter was sent out on December 1st, so you’d only have 24 days to get your flat abs. To get flat abs you’ll need to get very lean. And while exercise is a vital component you’d have to follow a very strict diet to get flat abs. If you’re following a very strict diet you can expect to lose a max of 1-2 pounds per week. So in four weeks you’ll lose about 4-8 pounds. If you are more than 4-8 pounds away from flat abs you won’t reach your goal in time for Christmas. Second, if you’ve got to lose more than 8 pounds to get your flat abs, are you really going to go on an extremely strict diet the 3-4 weeks before Christmas? You have to set realistic, attainable goals. Otherwise you’ll set yourself up for failure. If you fail enough times, you’ll simply give up and stop trying. And when you stop trying, you’ll never reach your goals. I want you to be successful. I want you to reach your goals. I will help to set you up for success. When your priorities are rooted in your superficial appearance you are setting yourself up for failure. Because you’re never going to be happy with what you see in the mirror. The changes that will happen to your body are the by-product (or side effect), of genuine good health and wellness. And that change starts in your mind. If you want to improve your health, you’ll need to change the way that you think about yourself, food, and movement (exercise). When you change your mind, your way of thinking, then you’ll like what you see in the mirror. Think about it this way. If you don’t think that you’re worthy or deserving of good health, why would you even begin to engage in habits or activities that would lead to improved health? If you “hate” exercise, do you think that you’ll be successful at it? Have you ever been successful at anything that you hate to do? So to be successful you have to change your mind, change the way you think and feel about exercise. Now this is a process, a journey, there isn’t a switch that you can hit that will cause you to love to exercise when you currently hate it. But I can show you how. If you think of food that is bad for your health and in direct opposition to your goals as a “treat” or “reward”, then you need to change your mind. Change your relationship with food. Start to think of food that nourishes your body and improves your health as the reward. Again this is a process, and a journey. And the destination is good health! It might take longer than 3-4 weeks to get there but it’s worth it. And unlike the misleading, unrealistic goal of flat abs in 3 weeks, you’ll be equipped with the knowledge and understanding of how to maintain your good health for the rest of your life. The Reverse Crunch will help you to reestablish your ability to contract you abdominal muscles. It will also help to increase the strength of your lower abs. Start in a lying position on your elbows Bend your knees to 90 degrees. Leave your heels on the ground and lift your toes. Before you start to lift your legs off the ground you need you go into a posterior pelvic tilt. If you were wearing a belt, tilt your pelvis back so that belt buckle would get closer to your belly button. Your lower back should flatten out into the floor a little. Hold that pelvic tilt position during the entire exercise. Now lift your heels off the floor until your shins are parallel to the floor. Then slowly lower your feet back to the floor. If you lose the pelvic tilt, reset it before performing the next repetition. If this exercise is easy you are probably not maintaining the pelvic tilt. If your stomach or chest bows forward, that is a sign that you are losing the pelvic tilt. This is a more dynamic abdominal exercise. Start in a lying position with your hands by your side. Lift your legs so that they are perpendicular to the floor; straight up and down. From that position lift your hips, knees and heels straight up toward the ceiling. In the “Finish” photo I exagerated the hip lift so you can see that your hips should be coming off of the floor. In reality you want to avoid having your feet move forward toward, or over your head. Your hips should only lift about 1-3 inches off of the floor. If this is easy you are probably swinging your legs a little too much. Return to start position and repeat. For this exercise there are three position. Please check the third picture below for this description to make sense. Start in the same position as the Reverse Crunch. Set your pelvic tilt. Extend your legs out straight and lift your feet a couple of inches off the ground. With out touching the ground slide your heels along the floor toward your hips. Then straighten your legs and lower your straightened legs back to the start position. After completing one set use the same exact positions but rotate your feet in the opposite direction. Lift your straight legs off of the floor unilt your legs are perpindicular to the floor. Bend your knees, then press your heels away from your body. Back to the starting position. Balance on you tailbone (boat pose/coccyx balance). Hold a medicing ball in both hands. Keeping it close to your body rotate your shoulders as far as you can. Rotate in both directions. A common mistace is to have very little shoulder rotation and to move the ball from side to side with your hands. The obliques, the muscle we are trying to strenghten with this exercise rotate the trunk/spine. So if we want to strenghten them properly our shoulders must turn. Add these four abdominal exercises to your daily routine. 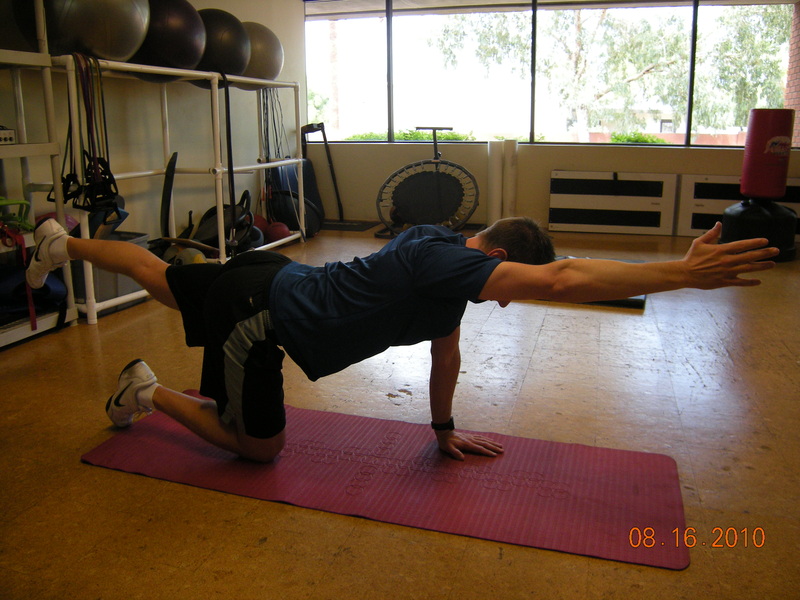 Do them at the same time as the four Core exercises that I introduced in Tip #9. Build up to doing two sets of each. 25 Repetitions each for the Reverse Crunch and Elevations. 15 Leg Circles in each directions. And do as many Medicine Ball Twists as you can. The Bridge is a great core exercise. It helps to strengthen the hamstrings, gluteals, and all of the muscles that support the lower spine and pelvis. This picture shows the end position of the bridge. To start you want to lye flat on the ground, bend your knees to about 90 degrees. Then press through your heels and lift your hips toward the ceiling. The goal is to lift your hips high enough so that there is a straight line through your knees, hips and shoulders. Hold for 30-60 seconds and repeat 3 times. The Plank is a core exercise that is rooted in Yoga. It helps to strengthen all the muscles that stabilize the spine and pelvis as well as the shoulder. Start by lying flat on the ground. Your elbows should be directly under your shoulder and your feet should be together with your weight on your toes. Lift your hips up so that only your toes and elbows (forearms too) are on the ground. Lift your hips until there is a straight line through your shoulders, hips, knees and ankles. The weight of your body should be directly over your elbows and toes. You should avoid pressing forward on your elbows or backward on your toes. Also avoid “A-framing” (hips too high) or “Sagging” (hips too low). Hold this position for as long as you can. Repeat 3 times. This is called a pointer because when you perform it you look like a pointer dog. Start on your hands and knees with your hands directly under your shoulders and your knees directly under your hips. Lift your right hand and left knee one inch of the ground. Hole this position while attempting to avoid any movement in the rest of your body. Take 4 seconds to slowly extend both your arm and leg simultaneously. Then take 4 seconds to return them to the start position (with out touching your hand and knee to the ground). Do 8-12 Repetitions on each side. The Boat Pose is also rooted in Yoga. I typically call this Coccyx Balance, because your coccyx bone is your tailbone. Balance on your tailbone lift your feet so that your shins are parallel to the ground. Your arms should be by your side, also parallel to the ground. Lift your sternum (breast bone), so that your spine is flat. Hold as long as you can. Repeat 3 times. Abdominal and Core Training have been around since the development of structured exercise programs. Ab exercises are nothing new they’ve been around forever. But the term Core Training has become very popular in the last ten years. To help explain the importance of Ab and Core Training it’s important to first understand what your Abs and Core are. The Core is open to a bit more interpretation. The most common interpretation of the Core is to divide it into an inner and outer unit. The inner unit being the muscles that stabilize the spine and pelvis (this includes the transverse abdominis). It’s accurate to define this as a “unit” because this group of muscles has an single nerve input. Therefore the muscles that make up the inner unit all contract simultaneously to stabilize the spine and pelvis. The outer unit is the Abdominal muscles that move the spine (listed above). In General, this definition of the Core is the most widely used and accepted in the fitness industry. And I can almost agree with it. Except the “outer unit” really isn’t a unit the way the inner unit is. The “outer unit” has multiple nerve inputs and we can consciously decide how to move our spine. The different movements that we’re capable of, engage a different combination of muscles (so it’s not really a unit). Other definitions of the core also include the muscles that stabilize and move both the shoulder complex and hips. The muscles that stabilize and move the spine, pelvis, hip and shoulders make up the majority of our muscles and a huge majority of movement we are capable of. If you look at the general definition of Core; “The central, innermost, or most essential part of anything“. Then including the hips and shoulders makes absolutely no sense. So here is my definition. The Core is made up of the muscles that stabilize the spine and pelvis. This fits the definition of core, they are the innermost muscles. It is also essential to focus on developing Core strength when beginning a workout routine, as well as maintaining core function throughout your training program and life. When functioning properly the muscles of the core contract a fraction of a second before your intended movement begins. This contraction is subconscious and serves one purpose. Your Core contracts to stabilize and support your spine and pelvis before movement to protect your spine from injury. When developing your Core and Abs program it’s important to begin with Core exercises. 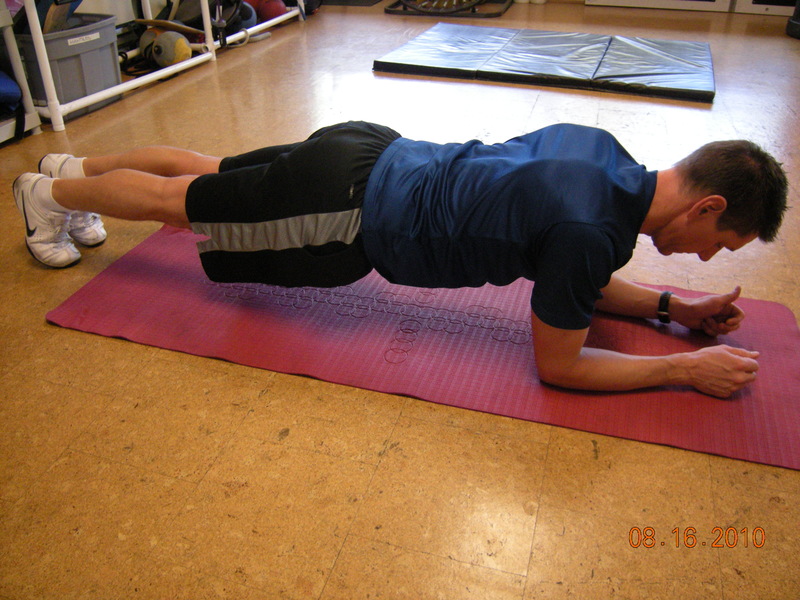 You should first develop adequate core strength then progress to adding abdominal strengthening exercises. For examples of some Core and Abdominal exercises please visit my “Photo Gallery” page. I believe in the benefits a good coach or trainer can provide and I've hired my share of them over the years to help me achieve my financial, personal and professional goals. I believe John Preston is one of the best.